You are part of our team and we are a part of yours. Regular communication is critical and we pride ourselves on it. Your job is not to worry about production, your job is to confidently tell the CEO, “It will be a truly memorable event,” and it will be. Whether it’s a small meeting for 10 or a conference for 10,000 – we’ve been there. Every event gets the same attention to detail. 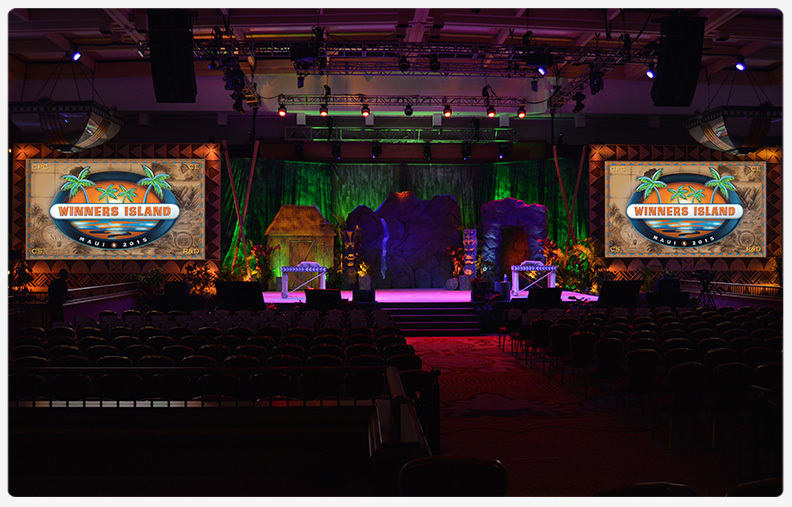 Our team has over 100 years of combined event and video production experience with hundreds of projects to show for it. Anyone can supply creative ideas, first rate equipment and skilled labor for a corporate event. We bring all that PLUS extra levels of depth and understanding along with a wealth of experience to produce world-wide and world-class events. Whether it’s working with our partners in Italy to help transport attendees to ancient Rome, in Australia where we showed the attendees how to soar over Sydney, or in Vail raising money for an important charitable cause… we bring your event to life. We are on YOUR team from start to finish, every step of the way. From detailed pre-production and location scouting, all the way through camera selection and final editing, our goal is always the same… to give you the best video production experience possible. Whether it’s an opening video for your meeting or a documentary for company-wide release, our experienced team of producers, cinematographers, location crews and editors are ready to share your story with the world. "The entire week was amazing for our attendees, special guests, senior executives, speakers, sponsors, everyone, especially me! You are all at the top of your game and I’ve heard nothing but wonderful compliments on how smoothly the conference went, packed with exciting videos, everything! From beginning to end you knocked it out of the park and it was and is a privilege to work with you!" Sincere thanks to Shannon, Michael, Paul and Tim and the entire 86Forty crew for your creativity, flexibility and patience. From working on the rally video, staging, script rewrites and “Show Time,” you were all ready, able and willing to make it happen. The highlights video continues to be a big hit!" "86Forty is destined for greatness! The team they have assembled is unparalleled in the event production world and having worked closely with Shannon and the team for 24 events I can say without a doubt, they are the best of the best! I can't wait to work with them again!" "Creative and professional, we can always count on Paul and the team to produce our most important events and videos. We love working with them because they are nice people who always make us look so good!" "86Forty is a key component of our success LONG before the event gets underway. We appreciate everything the entire team does on behalf of the Foundation and the wounded veteran community. We can be proud of the fact that we just experienced the most successful event in Blue Angels Foundation history! Thanks again and mark your calendars for next year."